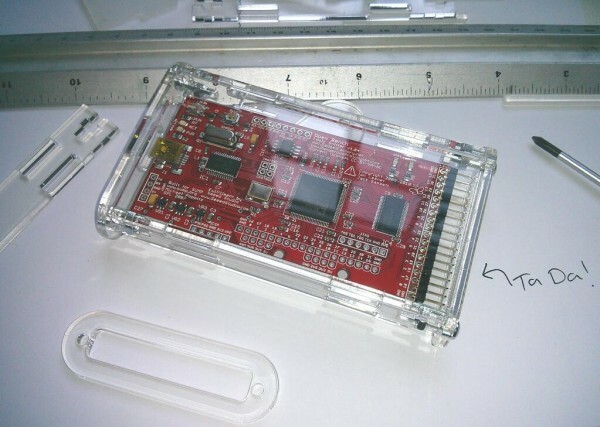 Here’s another cool acrylic case for Open Workbench Logic Sniffer by Phenoptix. Spent some time with the calipers and laser cutter earlier today and came up with what turns out to be yet another acrylic case! Dxf files for cutting are up on thingiverse. It does require a fixing not show in the pic above to keep the board in. I didn’t want to obstruct the headers at all. Looking at some of the other cases on the forum I think I’ll have to raise my game! This entry was posted on Wednesday, April 9th, 2014 at 11:39 am	and is filed under cases. You can follow any responses to this entry through the RSS 2.0 feed. You can skip to the end and leave a response. Pinging is currently not allowed. Very nice. It reminds me of the 2.5″ USB drive enclosures that OWC sells. I like.